What's the closest that an Apollo mission passed GEO on its way to the moon? No astronaut ever visited geostationary orbit at 22-23k miles to maintain or deploy satellites. The Apollo astronauts just rushed by on their way to the Moon and back. Question: What's the closest that an Apollo mission has passed GEO on its way to the moon? Did they end up always going substantially above or below it, or did they pretty much just pass right through due to the Earth's inclination. It's not a profound question, GEO was a lot less populated fifty years ago of course. While GEO could be abstracted as a mathematically zero-height line, if you'd like a height by which to define what "through it" means, then let's assume whatever a typical scatter would be in North-South station keeping in the day. Perhaps 1 degree or less? Apollo 11 first entered a 103 nautical mile orbit, and midway through orbit 2 was boosted onto lunar trajectory. This was 2hrs 50mins into the mission, so from this point onwards, mission control were not considering orbits of the Earth. Apollo 11 passed 22k nautical miles at 5hrs and 22 minutes into the mission. LOI -22 and LOI -5 hours with DV nominally zero (See Table 1-1). when other activities do not require different attitudes. (h) LOI1, performed at 75:54:28 GET, ends the TLC phase. Doff & Stow helmet, gloves and PGA's. There is an interesting point on page 115 of the flight plan showing field of view at 7hrs 0 minutes into the mission, and it appears to be directly overhead Honduras, at 15N, but I don't have range data at that time stamp. If we want to know the distance of the Apollo astronauts to the GEO orbit, we have to consider the different planes. The GEO orbit's plane is the equatorial plane of Earth tilted by 23.44 ° to plane of the Earth's orbit. The plane of the trajectory from Earth to Moon is close to the plane of the Moon orbit tilted by 5.14 °. For the calculation I assume the axis of Earth lying in a plane through the centers of Earth and Moon as shown in the graphic. We get the maximal distance in this way. 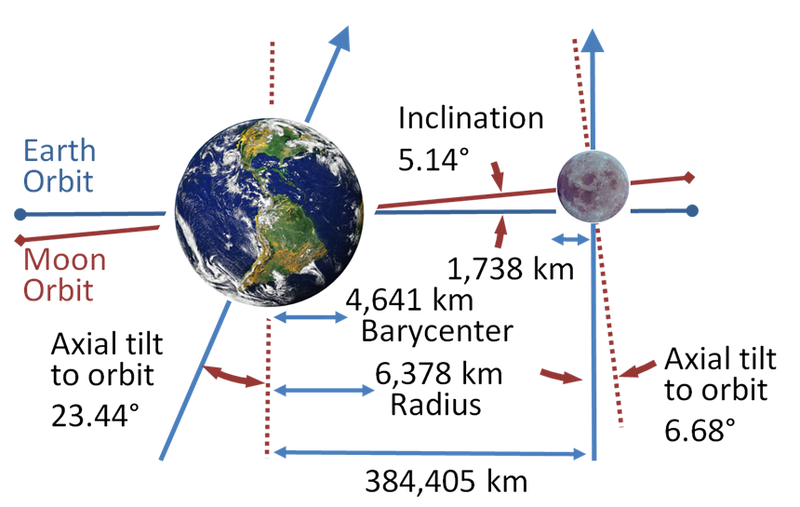 For the actual distance of each Apollo mission we need the individual position of the Moon. The angle between both planes is therefore 23.44 ° + 5.14 ° = 28.58 °. The radius of the GEO orbit is 42,164 km. We aply the formula c = 2Rsin(α/2) for the chord length of a circular segment and get the result 10,407 km. This is the distance at the closest approach between the Apollo trajectory and the GEO orbit. For a trajectory in a different plane we have to add or subtract the angle. Not the answer you're looking for? Browse other questions tagged apollo-program trajectory geostationary trajectory-design or ask your own question. What is the maximum mass of a satellite that can be placed in GEO? How many burns did the Apollo 11 mission need? What's the cheapest way to send 10,000 kg to Mars? Was there a Moon landing mission that the astronauts had to land by hand? What were the chances of failing the Apollo 11 mission? Did the Apollo astronauts ever describe reentry deceleration?